You didn’t really think I’d go through Valentine’s Day without posting a ridiculously festive dessert recipe, did you? Well, I didn’t think I would. You see, I’m not the biggest fan of Valentine’s Day. It’s not that I hate it; it’s not that I don’t think it’s a good idea to show those you love that you care about them. It’s just that I don’t tend to do so with giant pink and red balloons and flowers and chalky candy hearts and Valentine cards with temporary tattoos in them (but I did see some Disney Princess ones at the store the other day and they looked pretty awesome). Now the chocolate part, that I can get behind — or really, any part of the holiday that has to do with food (unless it’s those chalky candy hearts, which are not actually food but I swear some sort of severe tastebud torture). And I don’t discriminate in that department — though I do have a pretty sweet Valentine to call mine already, I also have some pretty sweet girlfriends on whom I like to shower gifts of the edible variety. It’s become fairly routine at this point that when a holiday comes around (or if I just feel like it), they get cookies — and they don’t seem to complain. 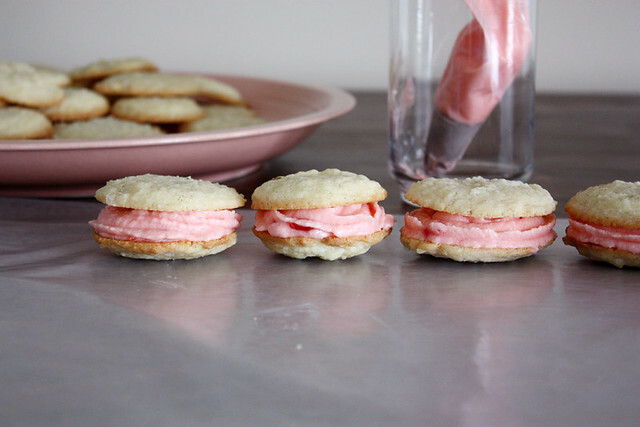 I mean, if you’re getting a package of these vanilla bean sandwich cookies with a fluffy maraschino cherry buttercream filling, would you? 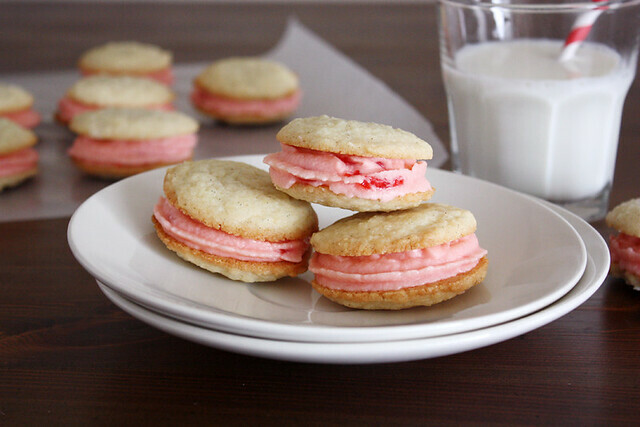 So when Betty Crocker asked me to come up with a Valentine’s Day treat for the single gals in my life using one of their pouch cookie mixes, I knew this would be the perfect recipe to use. Only very, very recently did I discover the magic that is the vanilla bean (terrible food blogger, I know! ), but I’ve always had a soft spot for maraschino cherries. When my brothers and I were little, we used to order Shirley Temples at restaurants all the time and fight over who got to eat the cherries floating between the bubbles (because, you know, eating just the ones in our individual glasses was NEVER ENOUGH). Using them to make a fluffy pink frosting to nestle between two soft and chewy vanilla bean-speckled cookies was obviously, then, a no-brainer — and testing one (or five) to make sure they were good enough to share with friends this holiday required even less thought. So, to recap: They’re delicious. Perfectly sweet, perfectly festive and perfect as a gift for all those lovely single (and married!) ladies in your life. Preheat oven to 375 degrees F (350 degrees F for a dark or nonstick cookie sheet). 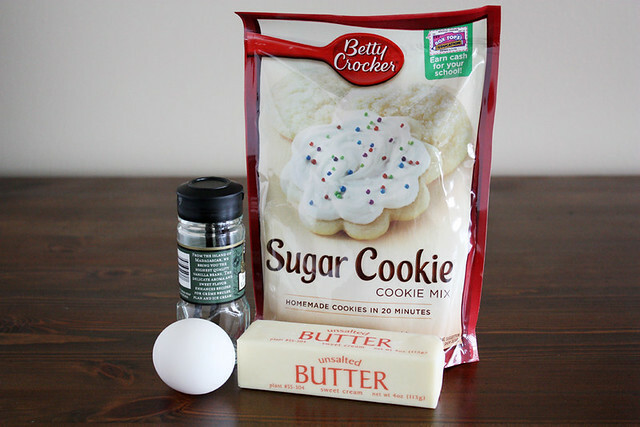 In a large bowl, stir together cookie mix, butter, egg and vanilla bean seeds until a soft dough forms. Scoop rounded teaspoonfuls of dough about 2 inches apart on ungreased cookie sheets. 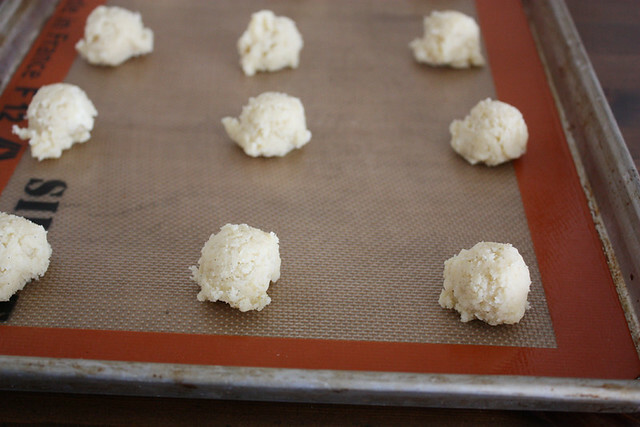 Bake 7 to 9 minutes or until cookies are just set and edges are lightly golden. Remove from oven and cool a few minutes on cookie sheets. 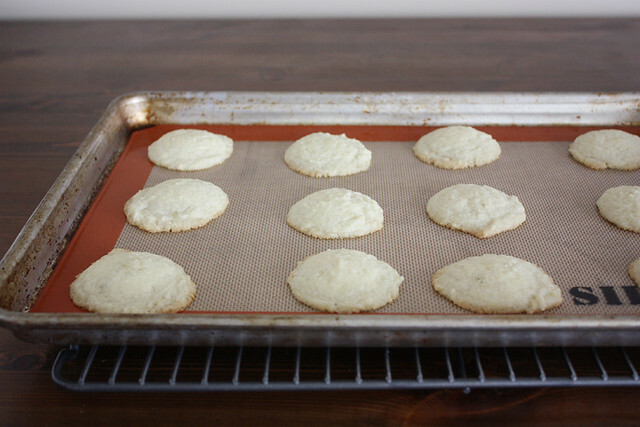 Transfer cookies to a cooling rack to cool completely. To make the frosting: In a large bowl or bowl of a stand mixer, beat together butter, powdered sugar, maraschino cherry juice and vanilla until a stiff frosting forms. Add more powdered sugar or cherry juice if needed to achieve desired consistency (it should be stiff enough to hold up to the weight of a cookie on top). Fold in chopped cherries. Pipe frosting on the bottom of half of the fully cooled cookies. Top with second cookie to form a sandwich. To wrap as gifts, place the cookies on a cookie sheet and freeze until they’re fully chilled (this helps the frosting from getting smudged when you package them). 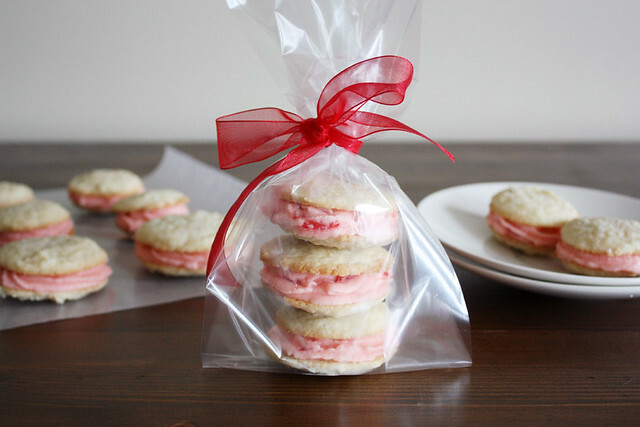 Place frozen cookies in pretty packaging and share the love. Single or not these look amazing! And I’m with you 100% on the Valentine’s Day thing…it’s fun, but just not my favorite holiday! These look so good and amazingly I already have all the ingredients, due to a pre-Christmas lazy spell. Thank you again, love your blog! They look pretty delicious. I think I’ll try to make these for the lady in my life this weekend. Never made cookies before though. I’m thinking I should double up on everything in case I destroy the first batch, which is very likely. These would be amazing anytime of year! I’m totally with you on the v-Day thing…but I also do love eating dessert and chocolate and red velvet. So I’m okay with any excuse to do those things! 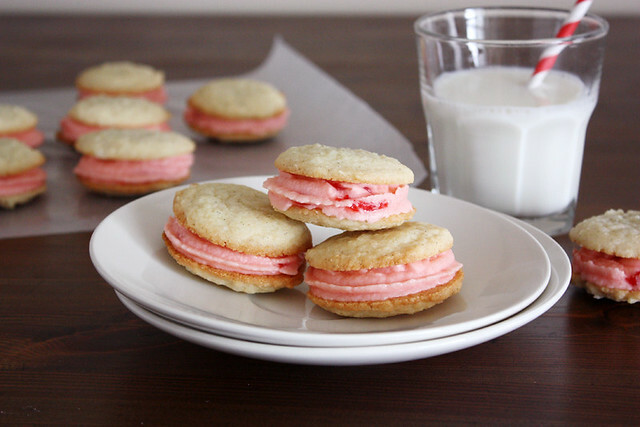 These sandwich cookies are perfection! Wow! These little cookies sound fantastic. 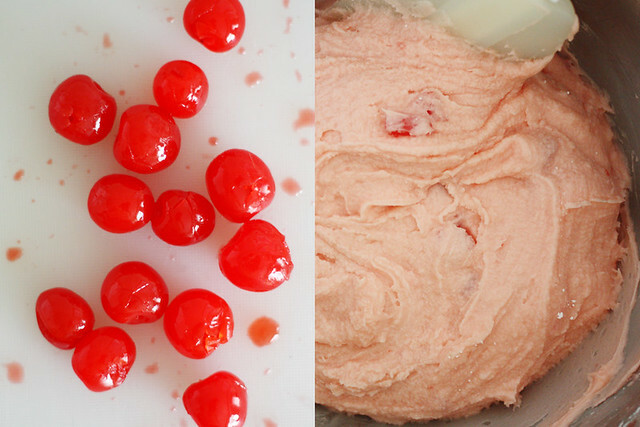 I really love maraschino cherries and I can’t say I’ve ever had them in frosting but I now feel very compelled to make these ASAP! Yum! Ive never used vanilla bean either! Bad bloggers..
Caroline — Thank you, dear! These look so adorable and perfect ! The Sketched Chef — Thank you so much! Don’t these just look like little bites of heaven? Cookies in the oven now! Hope the turn out as pretty as yours! Sarah C — Ooo, let me know how they turn out! Hope you like them! These are adorable and right up my alley! Thank you so much – I can’t wait to try them . . . and on any day, not just Valentine’s Day! I guess anything with these candy cherries would be good. I hope you will come up with more recipes with them ! Agreed – Valentine’s Day is not my cup ‘o tea either. But these cookies are adorable and look deee-lish! Kelly — I could pretty much live off the stuff. 🙂 Thanks for the comment! I know Valentine’s Day is old news. However, these cookies still seem like a super neat idea!